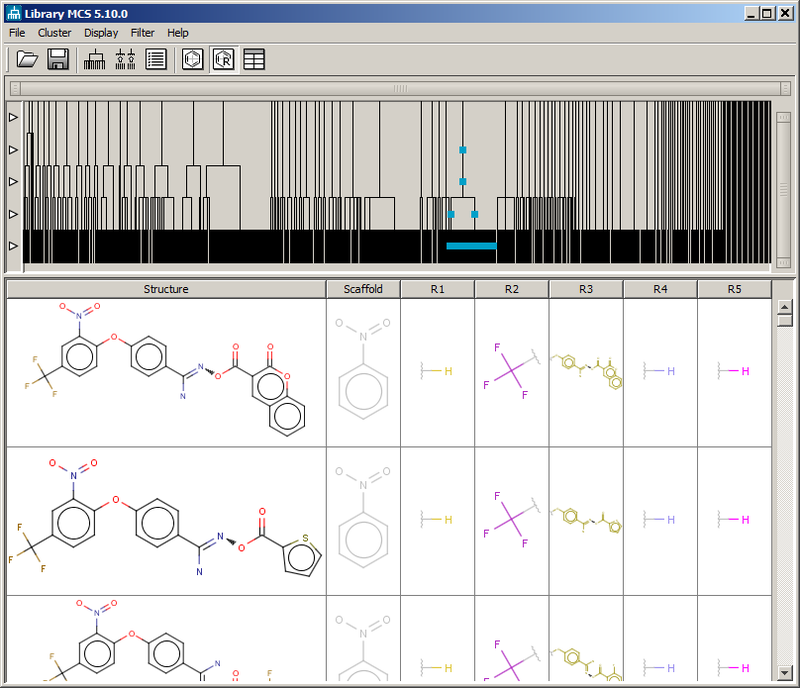 Library MCS (LibMCS) is a desktop application of ChemAxon to find and display Maximum Common Substructures of a set of compounds. 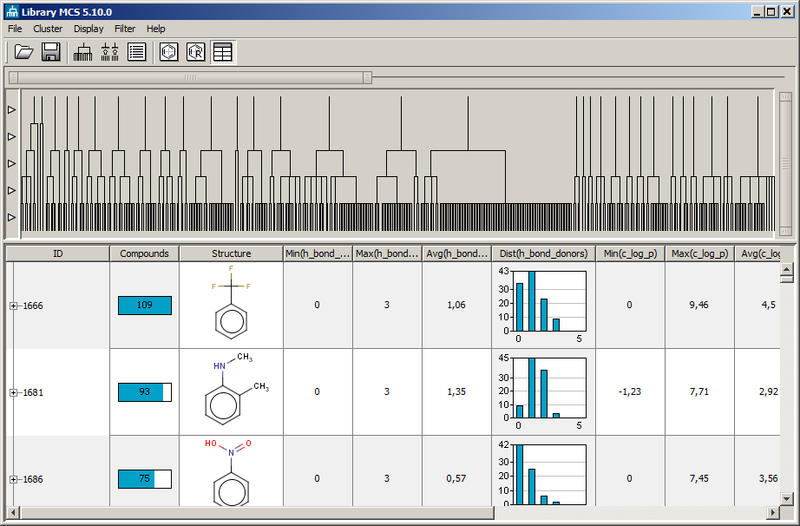 LibMCS is part of the JChem Suite. To run this application you need to have the JChem package installed on your computer. The application window contains menu, toolbar, and two main panels. The upper panel displays the dendogram, while the lower panel has three different view modes: Marvin View, R-table and Table View modes. By default, the heap size in some Java runtime environments is limited to 64MB, so you may run out of memory easily. The menu contains File , Cluster , Display , Filter and Help elements. 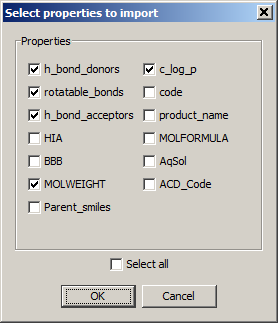 After the selection of the file to open, there appears the Select properties to import dialog to offer the possibility to select the desired properties for further calculations. You can change the selected/not selected status of the listed properties by ticking the checkboxes. The dialog lists the properties found in the file to open. LibMCS will determine minimum and maximum values, calculate distributions, display graphs, etc. on the base of the selected properties. 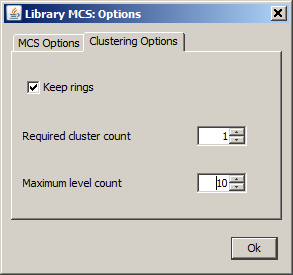 At the end of the file opening process the Library MCS: Clustering Report is displayed. All or the selected structures/scaffolds are saved into chemical structure file. Files saved by Save Graph... can be opened. The whole structure hierarchy is saved into file having own inner format. The settings of Minimal MCS Size and Maximum level count (see Options) may block level addition. 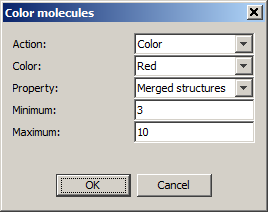 Color molecules dialog is displayed. 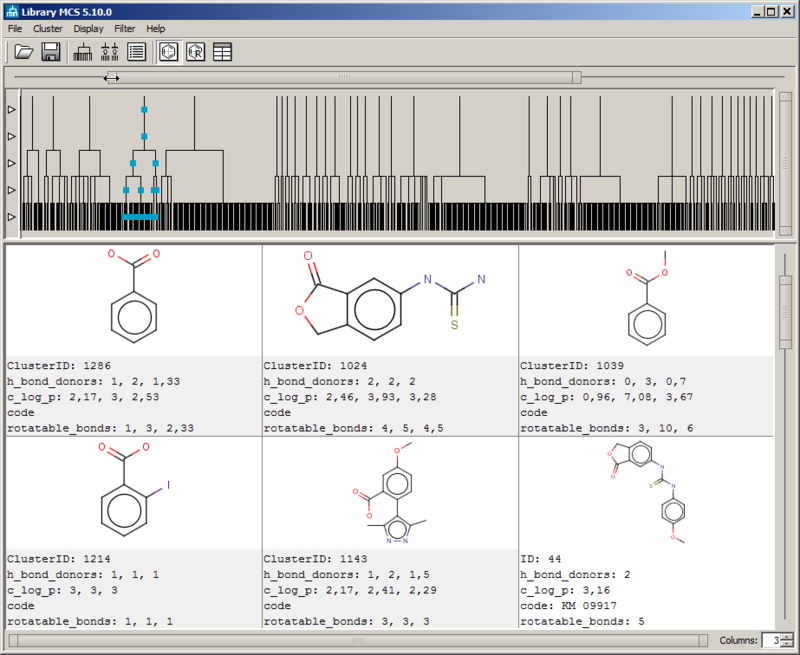 The Dendogram panel graphically visualizes the common substructure hierarchy of the compounds in the library. It provides possibility to mark nodes and leaves. The marked elements are displayed in the view panel. The bottom level of the dendogram contains the leaves, that is the chemical structures of the library. The upper levels contain the common substructures. The highest level contains the scaffolds. Some examples are highlighted on the picture below: nodes by orange, leaves by green color. Single click on a node marks the actual node. Double click on a node marks the actual node and its children. Right click on a node provides four possibilities: Mark node, Mark leaf nodes, Mark children, and Copy to clipboard. Horizontal selection: structures of one or simultaneously more levels can be marked by single click on the arrays at the left side of the panel. Application of the Ctrl button makes possible multiple selection. There are special sizeable scrollbars on the top and on the right side of the dendogram. They serve not only for moving the dendogram but - by dragging their parts highlighted by red color on the picture below - for zooming it as well. The View panel offers different view modes to view the clustering results. The structures marked in the Dendogram panel are displayed with/without data according to the setting of the Display > Properties in Viewer menu option. There are special sizeable scrollbars at the bottom and on the right side of the view panel. Fig. 3 Structures shown in the MView mode panel. Each structure is displayed in a separate MarvinView panel. The leaf structures marked in the Dendogram panel are displayed together with the scaffold and R-groups of the respective structure. The non-leaf structures are not considered. The nearest ancestor at the selection is found and used as scaffold. Selection in separate trees are possible, only the first is considered. The order of the columns can be changed by dragging their header. Fig. 3 In R-table mode the molecules are shown with their scaffold and possible R groups. Mouseover the Table view moves a transparent square over the Dendogram panel showing where the actual structure takes place in the Dendogram. Clicking on the plus sign in the first (ID) column opens one more level. The distribution chart data of the leaves selected in Dendogram are highlighted in red in the Table view. The order of the columns can be changed by dragging their header. 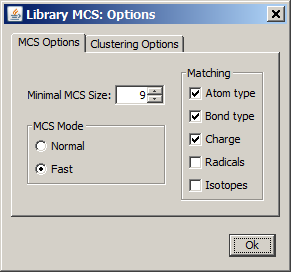 The minimum allowed size of any MCS found can be set with Minimal MCS size. When set, for instance to 5, possible common structures smaller than 5 atoms are dropped. The Maximum level count parameter defines the maximum number of hierarchy levels. For instance, there are cases when only first level clusters are interesting, that is, the common substructures of the input molecule are sought for, but these common structures are not clustered further. In such cases there is no point in generating higher levels of hierarchy. In order to stop libmcs after the first level is created (ie. all input structures are clustered), 1 has to be set in the parameters dialog. The Required cluster count parameter defines the minimal number of clusters required on the top level of the hierarchy. 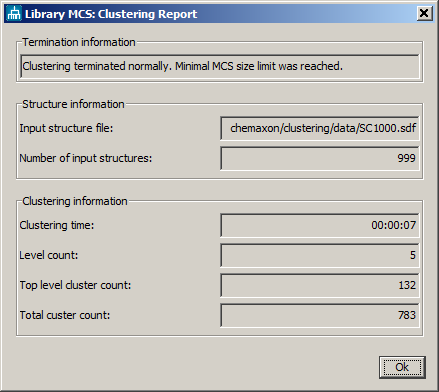 If the number of clusters gets smaller than this limit, the search terminates. Keep rings means that the clustering process handles whole rings, does not break rings. Visualization options can be set in Color molecules dialog. The Dendogram will be highlighted by the selected Action (Mark or Color) with the selected Color at the points representing the structures the selected Property values of which are between Minimum and Maximum. Clustering report provides information as seen below.